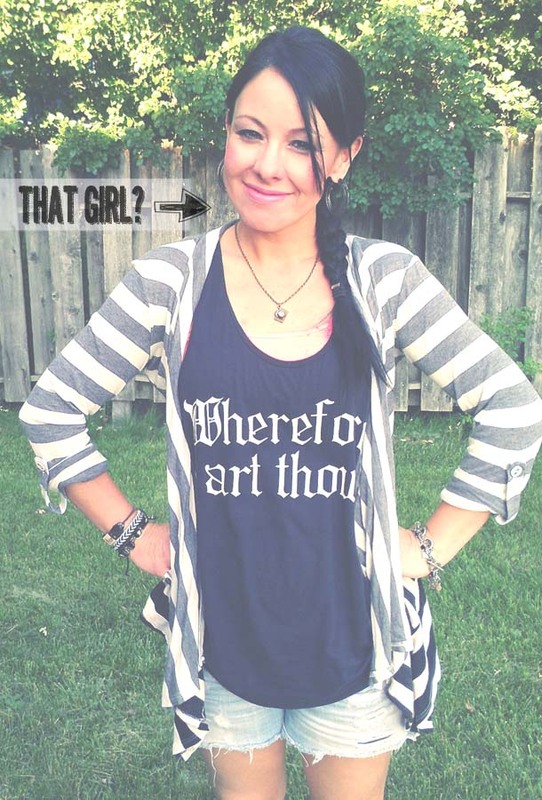 From Awkward To Art: That Girl? In my last summer/break update I mentioned there was a possibility of me speaking at a women's event over the summer. I can hardly believe I said yes. I committed to it. It was posted on our church website and facebook before I had the chance to back out. I have known for awhile (for close to a year) that God was leading me pushing me in this direction, but I certainly wasn't rushing it. Because I knew if setting any kind of example publicly (outside of my blog) were to ever happen, it would HAVE to be by the grace and strength of God. This has never been my thing. In the words of my 4 year old, "REALLY? Me?" Or Maybe you are thinking "Really? That Girl?" I know, right? Because if you know me, I mean if you really know me, you know that I like to hide behind the scenes. Despite that, I am stoked. I am beyond amazed at the things God has been teaching me this year and I'm excited to take it a step beyond typing and push myself to new territory. I love a good challenge. I'm trying not to over think what I am going to say, and just speak from my heart. I'm continually asking God for his wisdom to be revealed to me and that when I speak, it would be his words, not mine. In fact, this is something I have been praying daily in my personal life as well. That as I deal with my kids, as I love them, discipline them, guide them...or as I talk to my husband... or any other person or situation I come across during my day, that my words and my decisions would be guided with His wisdom. Lately, I've been wanting more than anything to be completely in love with Jesus. I told him that. I told him I don't know if I'm always there, but I want to be. I want him to follow me around, hang out with me, everywhere I go...just like you would, when you start getting those tummy butterflies and wanting to be with the new love of your life every second of every day. I want to feel that with him. Sounds funny to type out, but it's the only way I can describe it. I want to fall in love. I wake up every day and say "Jesus, hang out with me. I want to know you are there. I want to feel your peace and your presence with me all day long, today, and every day." It's really something indescribable...when I know he is here with me. It's something new for me. Anyways, just asking for your prayers as I take this small step in a big direction for my life. If you are in the Milwaukee area, by all means, come out and say hi! It's on Saturday, July 27th and it's a women's breakfast! Shoot me a message or email if you need any info! I will touch base and let you all know how it went! man, how tempting to come hear you! so very exciting to see you start to step out in this new challenge =) wow, this reminds me that I haven't replied back to your email... I started replying in my head on my way to bed as I recall. always glad and encouraged to hear what God's doing in your life! this is so awesome! And I love the way you described that relationship with JEsus. That's what I want too! Why oh why do I allow myself to miss out on that? If I was close, there would be NO WAY I would miss it!! So stinkin excited for you!! I absolutely adore reading how God whispers and obedience leads to awe. Praying for you, your journey, and you rockin this event!! Make sure someone takes pics and have a blast up there! So very exciting!!!! Go you and how amazing it will b for all those who hear your beautiful message and testimony! Oh how I wish I was back in Wisconsin to hear you! You inspire me! I soo wish that I could be in your audience. You come from such a real and wonderful place in your heart that you are just going to bless everyone in that room! this is truly exciting news! i KNOW you are going to be wonderful and those who hear you speak will be blessed! :) It's good that we step out of our comfort zones..that's been a theme for me the past couple weeks. God will bring amazing opportunities and great people into your life for either you to bless or them to bless you. Julie that is AMAZING, how humbling, I hope it goes just the way it ought, i can pray for you!!! This is awesome Julie. I am so happy for you. Wish we could hang out with Jesus together!! Ps..love the new look here. :) I always love your designs. I love your attitude. I know it must be hard but just think about stepping out on Faith and letting Jesus do his thing. I am currently reading "Firsthand" by Ryan and Josh Shook. I am sure your faith in Jesus is fine but I think this book might help you fall more in love with him. It has great ideas for connecting and falling in love with him. The blog looks amazing, FYI... and God's moving. Good luck, Lady although with Jesus in your corner... who needs luck? !